Thanks to Studio Canal, here is your chance to Win one of 20 x In-season double passes to The Chaperone. 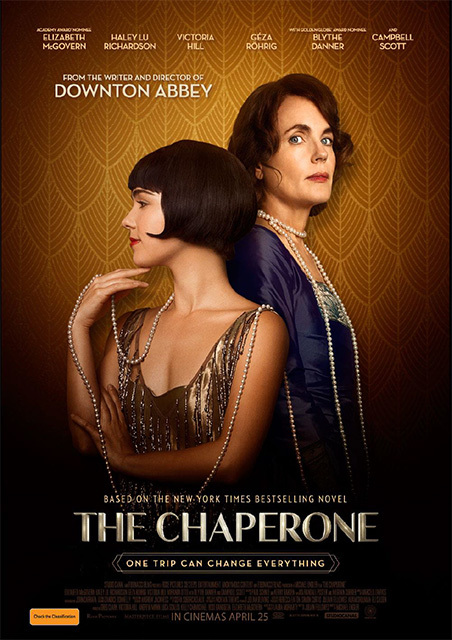 The Chaperone is based on Laura Moriarty's best-selling American novel about a woman (McGovern) whose life is changed forever when she chaperones a young and soon to be famous Louise Brooks (Haley Lu Richardson) to New York. The Chaperone has been adapted by Academy Award®-winner Julian Fellowes (Gosford Park, Downton Abbey) and is based on Laura Moriarty's best-selling novel of the same name. Directed by multiple Emmy® and DGA-nominated Michael Engler (Downton Abbey), THE CHAPERONE stars Academy Award®-nominated Actress Elizabeth McGovern (Downton Abbey). McGovern, who is also a producer, optioned the novel and worked with Fellowes to adapt it for the big screen. Joining McGovern in THE CHAPERONE are fellow cast members: Haley Lu Richardson (Split, The Edge of Seventeen), Victoria Hill (December Boys, First Reformed), Campbell Scott (House of Cards, Damages), Geza Rohrig (Son of Saul), Blythe Danner (Gypsy, Madoff) and Miranda Otto (The Lord of The Rings, Homeland).